Pair of Loyalty Oaths, includes: Partly-printed Document Signed, “W.H. Wells Lt. & Provost Marshal, 1pp. oblong octavo, Lavergne, Tennessee, July 30, 1863, and reads “A.N. 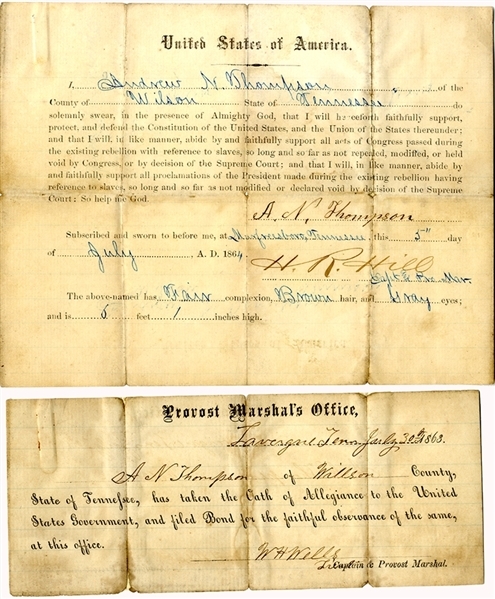 Thompson of Wilson County State of Tennessee, has taken the Oath of Allegiance to the United States Government...” Good condition...plus; Partly-printed Document Signed “H.R. Hill” and “A.N. Thompson” 1pp. quarto, Murfreesboro, Tennessee, July 5, 1864, and states that Andrew N. Thompson will “abide by and faithfully support all proclamations of the President made during the existing rebellion having reference to slaves, so long and so far as not modified or declared void by decision of the Supreme Court...” Very good condition.